Many customer are walking the aisles of The Home Depot Garden Department dreaming of the spring. Feeding the birds is a favorite past time for gardeners and outdoor enthusiasts during the winter months. Over 53,000 Americans feed the birds around their homes, gardening is the number one hobby of Americans, and next is feeding and watching birds; needless to say the birdseed aisle at the Home Depot is a highly shopped. 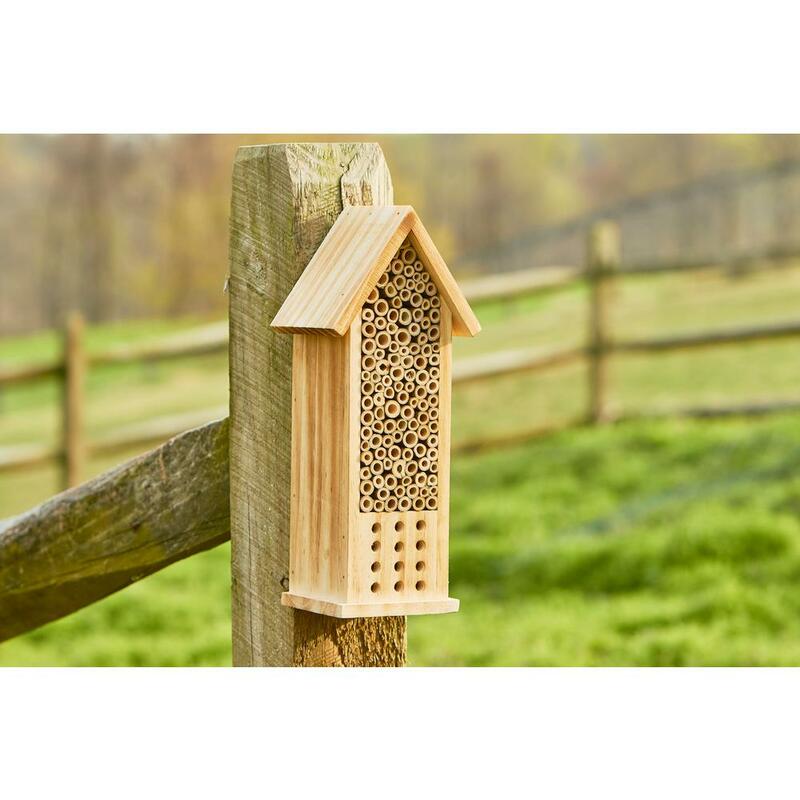 A new product graces the shelf in the birdseed aisle of The Home Depots across America, the tiny structure sits alongside the bird feeders and the brightly colored humming bird feeders, and there is quite a “buzz” about the Bee House. The special little house consist of multiple layers of tiny reeds and tubes, the natural slim cylinders are stacked and lined up, and with a quick glance it looks like a honey comb, bee hive. I first saw a Bee House when I was In Ireland last spring, once it was identified for me ( I asked straight away) I then saw them numerous times during my trip across the Emerald Isle. The tiny artistic structure caught my attention everywhere; the variations in design and color was beautiful; the tiny habitats were tucked into gardens, on fences and tucked into the crevasse along the miles of beautiful stonewalls.....a hundred, thousand welcomes to the bees as well! 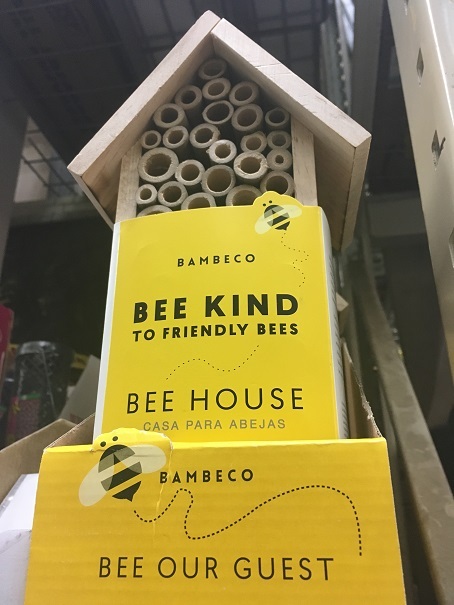 I was so excited to see the Bee House on the shelf at the West Roxbury, Ma., Home Depot, with so many Bee Houses offered on Home Depot.com as well. 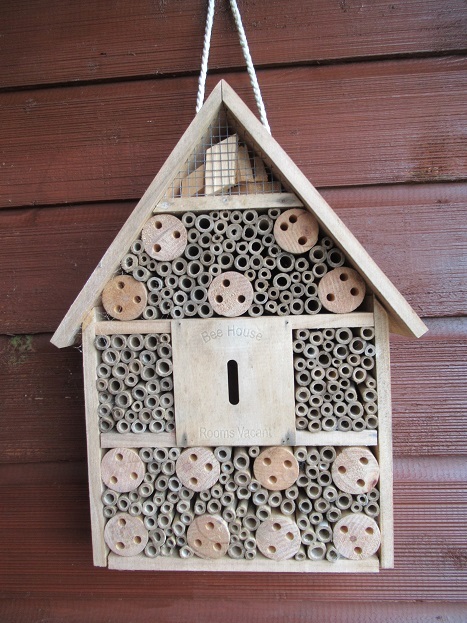 A Bee House supplies solitary bees such as “Mason Bees” a safe, secure place to put nectar and pollen and also deposit eggs. Mason bees are a cavity nester, (no hive) there are 4000 native bees in America…did you know that Honey Bees are non-native bees, Honey Bee were brought by the early American settlers from England to help with crop pollination, they landed in Plymouth with the Pilgrims. Mason Bees are 100 times more effective with the pollination process than Honey Bees, Mason Bees coat their entire fuzzy belly with pollen and fly from flower to flower pollinating more effectively than the Honey Bee. The Mason Bee will stay close to its home; it has a fight pattern that circles flowers, vegetables, herbs and trees for 30 minutes and then returns home to deposit its treasures of nectar and pollen at the back of the cavity. The process continues with deposits of eggs and then the Mason Bee brings in mud to create a chamber cap or plug and this process continues until the cavity, tube or reed if full with a final sealed lid just like a “Mason Jar”. Unlike Honey Bees, Mason bees are extremely docile the males do not have stingers and the female will only sting if pinched or cornered. Providing a haven for the pollinators will benefit all of us! Bees are responsible for pollinating 1/3 of the food for the human race, which is a lot of work and a huge responsibility. As consumers of the food crop we should help in any way we can to promote the health and well-being of the bee population: be sensitive and cautious to everything you spread or spray in your garden, place a Bee House by your house! Just like bird feeders, bird houses, and bird baths we are responsible for the up-keep and cleanliness of the Bee House. The seasons end bring a few task to annual cleaning and refresh and replace some of the tubes in the Bee House, and also it is beneficial to harvest and protect the bee larvae. Watch this quick YouTube video on the process of harvesting the next generation of Mason Bees. Stop by your local Home Depot and check out the Bee House, the tiny house may be one of the most important pieces of real-estate you will ever purchase! Fascinating article, I never knew such bee houses existed. 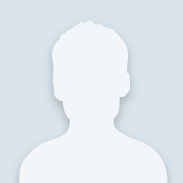 Are Mason bees propagated all over the country or just in the farm regions? According to all my research Mason Bees are native to North America, not specific to the farming regions alone, Mason Bees are buzzing all around the United States, all you have to do is invite them over!